I get more compliments about my brows than the rest of my body! *laughs* Don't get me wrong, I'm not being sarcastic about it, it's just funny how people are really into brows nowadays they compliment them like a whole new individual! That said, I need to live up to the "gorgeous brows" expectation by making sure to keep them looking "naturally gorgeous". So trying out different brow products from different brands is definitely part of this "AMW Reviews" game. I get the goosebumps whenever I'm holding up a New Brow Product! Just like the new brow product from K-Palette! These are called 3Way Eyebrow Pencils! Eeeekk, I can't wait to fill in my brows looking at this photo! 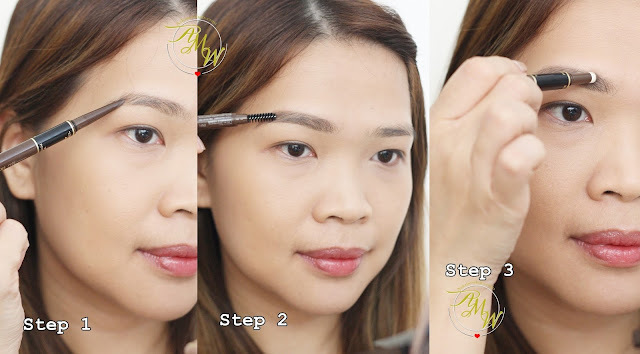 So indeed, I tried the quick 3 steps to achieve better looking brows! Each pen comes with a brow pencil, a powder side and a spoolie. I picked 02 Natural Brown to use and review because I prefer to lighten my brows with a brow mascara after, so I do not find the need to pick a light colored brow pencil. As for application, I like to brush my hair first to clean up extra brow hairs or dirt, using the pencil side, I slowly fill in my brows using short hair-like strokes starting at the center of the brows. It is also best to brush brow hairs with the spoolie after every application to make the application look more natural. On to the powder side, I fill in powder on the inner corner of my brows for that natural faded effect. This is the brow look I've been trying to achieve by using eyeshadow or brow powders but the effect looks more natural and prettier with the K-Palette one! Pencil side is so slim it is very easy to mimic brow hairs. The result is amazing! The effect is super natural I even have someone complimented me asking me if I had my brows professionally tattooed. Long-lasting. The brow product stayed until makeup removal. The powder side is very subtle, so it could be okay to some while not okay to others who like more pigmented brow powder. I also felt like I won't be able to maximize the use of the brow product because I can't seem to "reach" to the bottom side of the container. K-Palette Lasting 3Way Eyebrow Pencil is priced locally at Php795.00, available at Beauty Bar, Rustan’s (Shangri-la, Makati, ATC), SM Department Stores (Megamall, Mall of Asia, Makati, Aura, and North Edsa), Metro Gaisano (Fairview Terraces, UP Town Center) and Zalora. 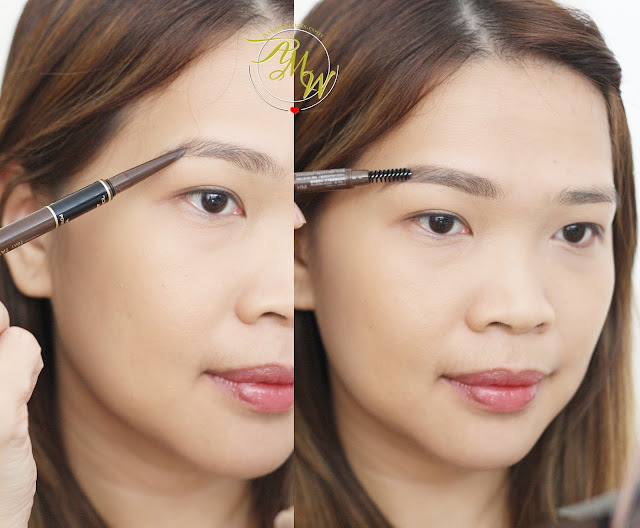 Have you tried 3Way eyebrow Pencil from K-Palette? What's your favorite K-Palette brow product? I love it so natural on you anyway, I really like the k-palette eyebrow pen because I can literally swim with it when set properly. Yes you are the queen of natural looking perfectly filled eyebrows. This pencil is I dunno, a little ashy (grayish) than your natural brow hair but maybe it's just the photos. That said, you never can tell it's just a filler. I zoomed like 3 times.